Lookin’ for more short and long-term forex setups this week? 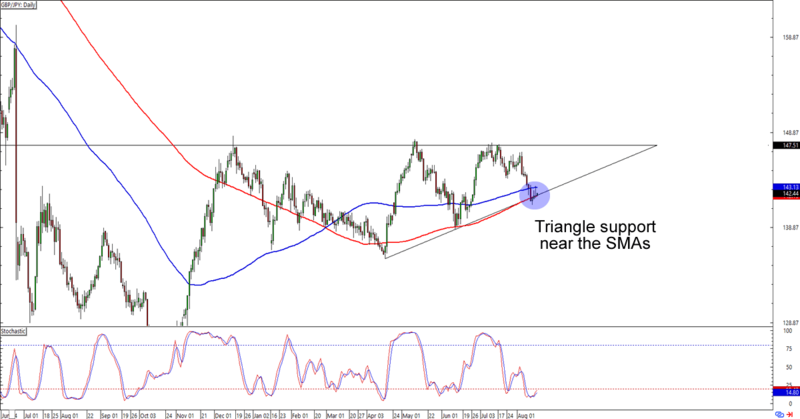 I got you covered with a short-term trend on EUR/USD and a long-term triangle on GBP/JPY! Remember the start of a downtrend that we spotted a couple of days back? Well, it looks like the bulls and bears were in the mood to extend the pattern! EUR/USD is now about to hit the 1.1750 minor psychological handle after bouncing from its 1.1690 lows. What’s interesting about 1.1750 is that it’s near the mid-channel lines AND the 100 and 200 SMAs on the 1-hour time frame. The cherry on top of the sweet setup is stochastic almost hitting the overbought region. Will the euro extend its short-term downtrend against the dollar? 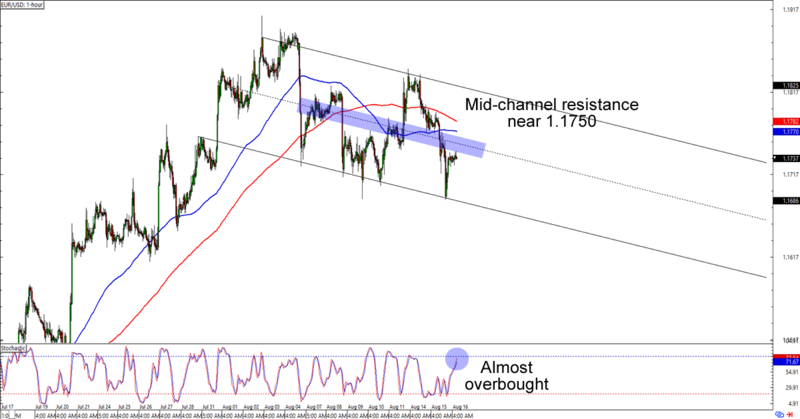 Shorting at mid-channel levels could give you a decent reward-to-risk ratio especially if the downtrend gains momentum. Of course, you could also choose to short around 1.1800 for a better risk ratio. In any case, make sure you practice good risk management decisions when trading short-term setups like these! I spy with my little eye a nice triangle play in the making! GBP/JPY is lollygagging at the 142.50 area, which is right smack at an ascending triangle support on the chart. Not only that, but the pair is also poppin’ up hesitation candlesticks! What makes the support level even more attractive is that it lines up with the 100 and 200 SMA on the daily time frame. Oh, and check out stochastic chillin’ like a villain on the oversold territory! Buying at current levels is a good idea if you think that Guppy will stay inside the triangle to retest its 147.50 resistance. If you’re one of them breakout traders, though, then you could also wait for the pair to break lower from its current consolidation before you bust out your breakout strategies. Good luck and good trading, my brothas!